Alexandra Rose “Aly” Raisman is an American gymnast, born on May 25, 1994, in Needham, Massachusetts. She is raised as Jewish and has three younger siblings, namely: Brett, Chloe and Madison. Her training began very early, at just 2 years of age; it all started when her mother, Lynn, a former high school gymnast, enrolled an energetic child in “Mommy and Me” classes. Her love for this sport grew in time, inspired by the performance of the “Magnificent Seven” – the gold medal winning US women’s team at the 1996 Atlanta Olympic Games. She trained next to Alicia Sacramone, the famous artistic gymnast, whose guidance and friendship she valued very much. She has put gymnastics on top of her priorities list; she even graduated from high school on a “long distance” arrangement, through online classes while training for the Olympics at the same time. She also gave up her scholarship to the University of Florida in 2011 and decided to pursue the career of a professional athlete, signing with the Octagon sports management firm. She was a member and a captain of both 2012 and 2016 US Olympics Teams, winning gold and bronze medals in different disciplines. Aly Raisman started competing in 2009 at the American Classic in San Diego, where she had placed 10th in all-around. By the end of the year, she started performing better on various national and international competitions and ended up placing 3rd in all-around and 1st on vault and the floor at the Junior Pan American Championship in Brazil. In the next two years, her results varied and unexpectedly, she was made a team captain at the 2011 World Artistic Gymnastics Championship in Tokyo, where she placed 4th on the balance beam and 3rd on the floor. She found a way to work on her skills and at the London Olympic Games the following year, her brilliant performance led to a gold medal for the US Olympic Team. She was also the first American woman to win a gold medal on the floor. In 2015 she won a team gold and individual all-around bronze medal at the city of Jesolo Trophy competition. After the Olympic Trials in 2016, she was named a member of the US Olympic Team once again – she won a gold medal in a team event and silver medals in the individual all-around and floor exercise. Aly Raisman is a spokesperson for the healing institution that treats individuals who suffer from eating and psychiatric disorders, called “Walden Behavioral Care” and is a positive body image advocate. She admits to not always liking her body shape, especially when it changed through the high school years, but says she has learned over time to look at the mirror and just focus on the things she really loved about herself. She continues by saying women are having a really hard time these days, being presented with numerous images of beautiful models, trying to compare and alternate themselves to be more like them. As a part of her positive body image campaign, she decided to pose for the “ESPN Body Issue” magazine, showing off her strong, muscular body by striking unbelievable poses using gymnastics equipment, such as circles and great exercise mats. Aly Raisman is a strong, energetic young woman that clearly enjoys performing. She says gymnastics is never boring for her and there is always room for improvement through exercise; essentially, it is a process of trial and error. Her favorite event is the floor, where she is confident and performs best. When she is not performing or working out in the gym, she enjoys shopping, spending time with her family and friends, practicing hot yoga or deciding to use a portable dance floor, where she can enjoy her favorite Hip-Hop and R&B beats. As part of her charity work, she is involved in activities concerning Special Olympics events. Aly Raisman was the captain of the “Fierce Five” team, which had won the second ever US team gold medal at the 2012 London Olympic Games. 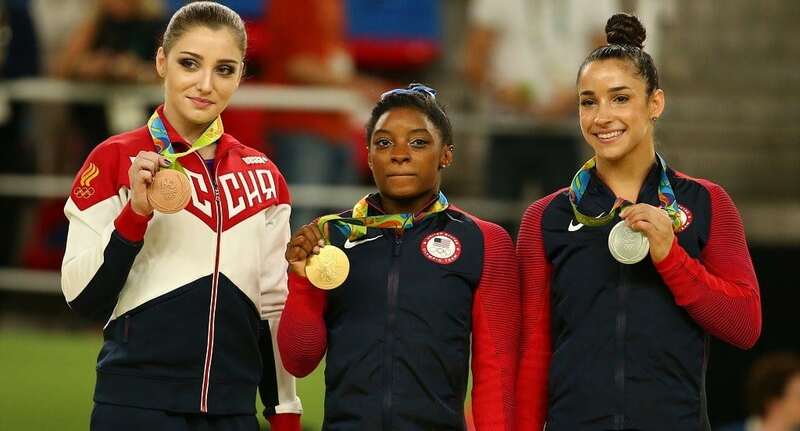 Furthermore, she earned a gold medal on the floor and a bronze medal on the balance beam. At Rio in 2016, she was made a captain of the US Olympics Team once again, named the “Final Five” this time, where she had won a gold medal in a team event, which made her and her teammate Gabby Douglas the only two Americans with back-to-back team golds. She was also a member of the 2011 and 2015 World Championship American Teams, helping them into winning gold medals. The athlete got the chance to express her passion for dancing in the Season 16 of the famous TV show, “Dancing With The Stars,” where she had placed 4th with her dancing partner, a two-time champion, Mark Ballas. She has also made an appearance in the previous season, with the rest of her 2012 Olympics teammates, doing a freestyle dancing number with the 2008 Olympic gold medal winner Shawn Johnson and her partner Derek Hough. Aly Raisman is certainly a national treasure as she has been a part of the US Olympics winning teams, captaining both of them to the victory. She is described as the spine of the team by her coach and teammates and, according to them, she is the most trusted gymnast. Even when she is not in the spotlight, she leaves her heart and soul on the floor, scoring points for the team. She is a passionate, strong woman, standing by her beliefs and speaking them out loud, freely.